Ashley Mendelsohn, Assistant Curator of Architectural and Digital Initiatives at the Guggenheim Museum, is one of the curators responsible for defining the museum’s engagement with architecture and technology. 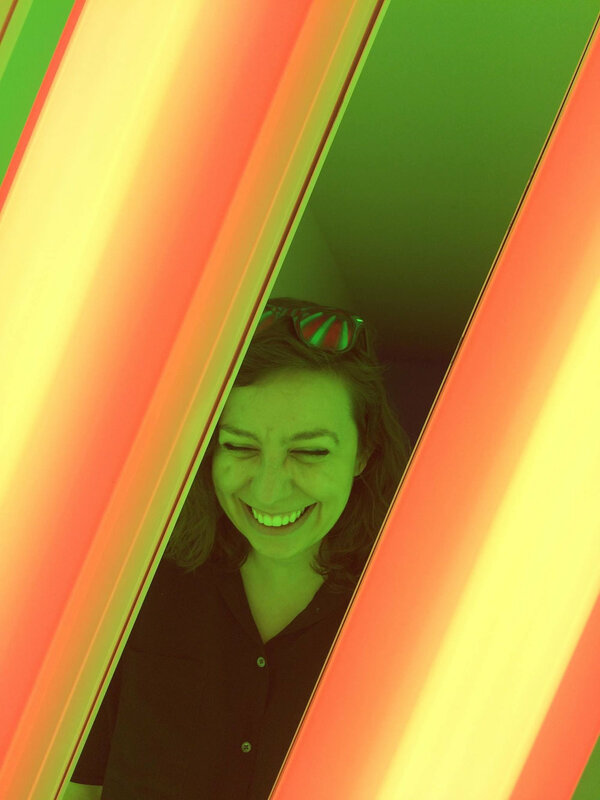 Since joining the Curatorial Department in 2015, Ashley has supported the organization and design of various exhibitions, workshops, and symposia, including Guggenheim Helsinki Now (2015), Åzone Futures Market (2015), and the 2017 presentation in Cafe 3 of large-scale photographs of the museum during its construction. She is currently assisting with two forthcoming exhibitions, Architecture Effects (2018) at the Guggenheim Museum Bilbao, and Countryside: Future of the World (2019), a collaboration with Rem Koolhaas/AMO. Ashley holds a master’s degree in design studies from Harvard University’s Graduate School of Design and a bachelor of architecture from Cornell University; she has also taught at both institutions. At Harvard, she received the Graduate School of Design’s Urban Project Prize for her thesis “Learning from District Six: Drawing on Cape Town.” Ashley previously worked in the Guggenheim Museum’s Exhibition Design Department, where she assisted with John Chamberlain: Choices (2012) and Moholy-Nagy: Future Present (2016), among other presentations. In her conversation with Julia Gamolina, Ashley talks about her transition from architectural to exhibit design, and eventually to curating, advising those early in their careers to never give up in the search for fulfillment. AM: I owe my interest to my grandmother. She was a public school teacher here in New York City, but she was also a self-taught architectural historian. In her fifties, she started to give architecture tours! From a really young age, whenever I visited her, she couldn’t help but give me a tour as we walked through the city. My grandmother taught me to be aware of my surroundings and gave me the vocabulary to talk about architecture in a nuanced way. She also always speaks about buildings in the context of history and people, and that has had a really profound effect on me. You went to Cornell, which is where you and I met. What did you learn about yourself during your time there? Along the lines of the critical awareness my grandmother instilled in me, architecture school taught me to think on multiple scales at once and to consider problems in a holistic way. Architecture school also teaches you how to manage stress [laughs] – it reveals to you how you deal with a complex design problem but also the dynamics of trying to manage multiple projects and collaborators at once. All these skills are so easy to translate in every aspect of your life. You’ve held a few positions in architecture offices before moving into exhibit design, and eventually into curating. How did your experiences in those offices inform your transition? I worked at both small boutique firms and larger, more corporate offices, and in positions that ranged from marketing to design. This diversity was really intentional – I was trying to figure myself and the field out. As I held these positions, I saw the complexity of the profession and the whole spectrum an architect’s responsibilities. After several experiences, I recognized that the things that I cared about the most really had to deal with people, and I mean individuals, not “people” as a general group of users. The questions that I was interested in answering, like wanting to know why a library in Atlanta would be different from a library in Beirut, didn’t seem to be the priorities of the firms I was at. I leaned towards the kind of work that wasn’t going to make money for an office [laughs], so I recognized over time that the traditional path of an architect wasn’t for me. What officially sparked the transition? In 2011, I saw an ad for an internship at the Guggenheim in exhibition design. Everyone in my life, mostly for financial reasons, told me that quitting a steady paying job for this internship would not be a good thing to do. I gravitated to that position though, recognizing this other world and scale of design that felt more appropriate for me. There is also nothing like exhibition design at the Guggenheim – the space is so unique. I ended up staying on after the internship was over, and probably would have stayed longer, but although no longer an internship, my position was temporary, so I jumped at the opportunity to take a teaching job at Cornell for a year. What did you learn in teaching? Teaching has always played a role in my career, even when I was in undergrad working with other students – you learn so much about yourself through teaching. You gain the ability to be precise; your thoughts have to be crystal clear in order to effectively communicate what you’re thinking to someone else. I also always so appreciated what other students had taught me, and made sure to make time to pay it forward. I started teaching in an official capacity with the Cornell summer program for rising high school seniors, which I myself had attended with the encouragement of my grandmother. A little more than a year later I returned as a Teaching Associate for the first year undergraduate design studio teaching alongside professors Val Warke and Jim Williamson. Throughout grad school, I taught in several capacities as well. Teaching, for me, intrinsically has a curatorial component: identifying the deliverables and presentation order for a review shapes the conversation and the review overall is essentially an exhibition of the studio to the faculty and broader student body. After this year of teaching, you went to Harvard for a Masters in Design Studies in Art, Design, and the Public Domain. Tell me about this step. While I was teaching, I still always had the intention of being the kind of person that the Guggenheim would want to hire full-time. That’s specifically why I applied to and went to the Harvard Graduate School of Design for a Masters in Design Studies in Art, Design, and the Public Domain – I wanted to continue working in exhibition design at the Guggenheim and thought that with this degree, I would be a better applicant. I was really intentional with my time at Harvard; while developing my thesis, I enrolled in courses across the university, from anthropology to divinity to engineering, as a way to tackle my chosen topic and site from an interdisciplinary perspective. That ultimately broadened my thinking and research interests beyond design. Your first experience curating was when you founded a gallery, 40 Kirkland Gallery (now GSD Kirkland Gallery), at Harvard GSD. There is a great space at Cornell, Hartell Gallery, which allows Cornell Architecture, Art and Planning students to apply and exhibit their own work. Going straight from teaching at Cornell, to studying at Harvard, I was surprised to find out that a gallery like this didn’t exist at the GSD. There’s the main floor of Gund Hall, which is an exhibition space, but individual students couldn’t apply to do show their work there. I spoke about this to the Administrative Director of the Advanced Studies Program at the time, Barbara Elfman. She was the one who created an amazing opportunity for me, which was to turn two adjacent rooms on the ground floor of 40 Kirkland into a gallery for GSD students! Since it was my first month at school, I had no budget or support, so for the first exhibition, I just poked my head into a review and encouraged some students to reformat their work. By the end of my time at the GSD, I was working with a team of students and soliciting proposals from the entire student body. The gallery became a place for students across the school, from architecture and landscape architecture to urban planning and design, to come together to share research but also to just socialize and get to know each other. Incredibly, the gallery still exists and I heard it’s even been recently renovated. Another curatorial project that you thought up and carried through is one that I love, Circus For Construction. Tell me about this. During my second year at the GSD, Storefront for Art and Architecture put out an open call competition for people to create outposts of Storefront in other cities: World Wide Storefront. This was really a curatorial call. A group of my close friends, Ann Lui, Ben Widger, Craig Reschke, Larisa Ovalles and I got together and applied, and because we all had design backgrounds, we proposed building a new space as opposed to finding an existing space and programming for it. We designed an alternative and experimental gallery space, “Circus for Construction,” located on the back of a traveling truck. We didn’t think we were going to win, and that’s probably why we pushed the design – we just wanted to propose something that we loved. When the time came for me to present my thesis, my friends came to my review, and after it was over, they were bursting and told me that we won the competition. This was exciting but also overwhelming because we had to make it real! We launched a successful Kickstarter campaign for $15,000 and built a custom semi-trailer that unfolded for temporary exhibitions in Boston, Buffalo, Ithaca, and New York. The project was beyond exciting. Since Circus and your Masters, you’ve been at the Guggenheim! What has it been like these past four years? After graduating, I was working on Circus over the summer and applying to jobs. I went into school thinking I wanted continue with exhibition design, but through teaching, Kirkland Gallery, and Circus, I had developed an interest in curating and wanted to keep pursuing that. Finding a job was difficult, in part because I had developed a really niche focus. Not every major institution even has an architecture curatorial department; these positions are so rare, and I wasn’t sure how to break into the field. Then a temporary position in exhibition design opened up again at the Guggenheim, and even though I hoped to take a full-time position out of school, I loved the team there and I accepted. I worked on two great shows, Moholy-Nagy: Future Present and Storylines: Contemporary Art at the Guggenheim. I also knew however, when I accepted the position, that the museum had an opening for an architecture curator. In the back of my mind from the beginning, I hoped they would hire someone that I could then convince to hire me. That’s not really how museums work, but they hired Troy Conrad Therrien, and in his first week, I went to his office and started pitching myself to him. He was new to the museum and was working on several projects at once, so I started helping out and slowly making the transition over to curatorial. After four months, I was offered a full time position as a Curatorial Assistant, and this last November, I was promoted to Assistant Curator. Now that you’ve been here for some time, where are you in your career right now? What are you grappling with? There are so many times in life when I’ve worked hard to plan ahead but I’ve recently stepped away from that and have been focusing on how long life is. I’ve been exposed to several people who have reinvented themselves later in life, and have learned that there is a lot of time to explore all your interests. When I concentrate too much on the next step, I realize I’m doing a disservice to now. Troy and I are working with Rem Koolhaas and AMO on an exhibition called Countryside: Future of the World that opens in October 2019, so I’m focusing on that. One thing I am consciously planning for now is developing my distinct voice, which is tricky. In the context of the museum, I write for the Guggenheim blog and give tours of the building (physical and Facebook Live!). This summer, I am participating in the Guggenheim’s annual Summer of Know series – public programs that pair artists with activists to discuss some of today’s most pressing social, political and cultural issues. I’m moderating a conversation that is so near and dear to my interests and am very excited to give a platform to Stephanie Alvarado, the Directory of Advocacy of 596 Acres and architect Jennifer Newsom of Dream the Combine. Together we will discuss strategies for activating overlooked spaces in our cities through the engagement of local communities. When you decide at a really young age that you want to pursue a career like architecture, it’s really hard to then not become an architect. You wouldn’t believe the number of times I’m asked, “Just to be clear – you’re not ever going to design a building?” Even though architecture is a professional degree, it’s actually a really complex set of careers. So walking away was hard, but I find a lot of satisfaction in what I do now, and find that I’m always searching for something more anyway. What have been the challenges specifically of being an architectural curator? Architecture curating is something that that field is still working to define, because it isn’t always clear how to display architecture! Architects firstly are not working to create things with the intention of exhibiting them in a museum, so you’re typically dealing with some kind of representation or facsimile. That’s ultimately what makes the job interesting; we are consistently defining new ways of working. Teaching has really informed the way I approach curating – there is tremendous responsibility to shape the way the broader public views the field because that broader public encompasses both the people who architecture serves as well as future clients. I think it’s really about creating the opportunity for a general audience to appreciate and value the nuance and complexity of the role of an architect. On the flip side, what have been some of the biggest highlights and what are you most proud of? I feel very lucky to have had a lot of highlights. I generally feel most proud when work that I’ve done has a direct impact on someone else: broadening perspectives and giving people the tools to think critically. That’s where I hope my curating can go. I work to put myself in slightly uncomfortable situations because it’s easy to get a little complacent and not work so hard when you’re comfortable. I’m also the kind of person for whom work is and always will be life, which is sometimes hard to describe to some people who strive for work-life balance [laughs]. I always say, “No, I need my work to fuel the rest of my life.” If I’m bored by my work, then everything is boring. To work hard to find something that is fulfilling for you. If you have the passion to put yourself through architecture school but don’t necessarily want to become a practicing architect, there’s a way to work in the field and be satisfied, even if it seems tangential at first. It’s worth it to discover where your fulfillment really lies, and to make a change if you’re unhappy, because when you do find what truly excites you, you’ll never look back.